Notice anything odd about these Revolutionary-era soldiers? Yes, indeed, some are wearing bell-bottom slacks, all the rage in the mid-1970s, but not exactly what one would have expected from a Continental soldier in the 1770s. A few others are in chinos. The date is April 27, 1975. 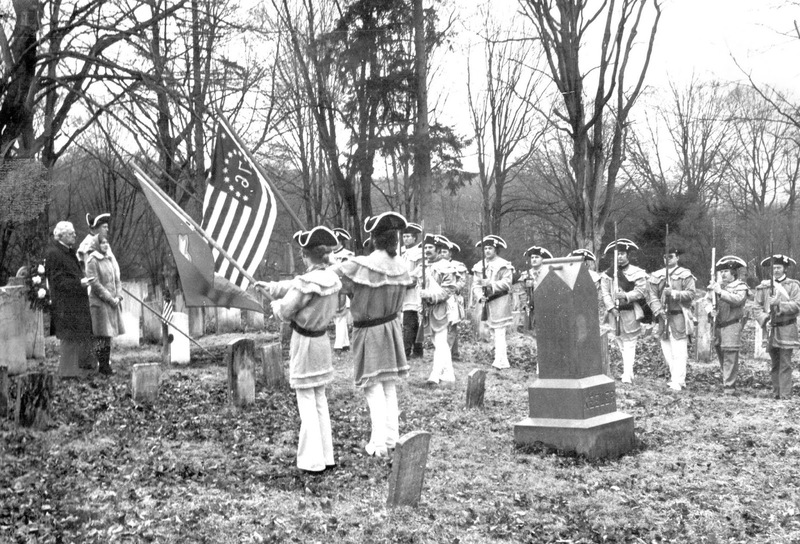 Members of the Fifth Connecticut Regiment, a group that had recently been founded to portray a regiment of local residents who fought in the Revolutionary War, are at the Titicus Cemetery off North Salem Road. 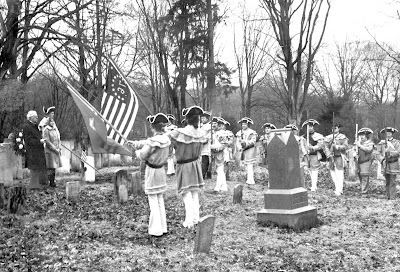 It’s the 198th anniversary of the Battle of Ridgefield on April 27, 1777, and the Fifth is saluting its long-dead commander. The original Connecticut Fifth was established in 1775 but did not see local action until 1777, when it participated in the Battle of Ridgefield. It later fought at the Battles of Germantown and of Monmouth. In 1975, the town, like the country, was preparing for the nation’s Bicentennial. A year earlier, several Ridgefielders decided it would be a fitting remembrance for the Bicentennial — as well as the Battle of Ridgefield’s 200th anniversary a year later — to have a local group to recreate a colonial regiment. They “resurrected” the Connecticut Fifth, raised money, obtained equipment and clothing, trained themselves, and began doing programs throughout the region, including appearing in many parades. Among the founders of the Fifth were Dennis Ambruso, Eric Chandler, Otto DePeirne, Jim Freebairn, Rick Gillespie, Fred Glissman, John Passiglia, Tom Pearson, and James Purcell, Jr. In this picture, we see the “new” Connecticut Fifth at a ceremony honoring Col. Philip Burr Bradley, a Ridgefielder who served as the regiment’s commander for many years. They are saluting his grave at the Titicus Cemetery. At the extreme left are three people: The Rev. Clayton R. Lund of the First Congregational Church, who would participate in many Bicentennial events since many members of his congregation 200 years earlier had been among the revolutionaries. Then there is Deborah Bradley Donnelly, a descendant of Philip Burr Bradley. Beyond her is Tom Pearson, who was commander of the “new” Fifth. However, at the time of this event, newly formed regiment couldn’t yet dig up the full and proper outfits for everyone. “The uniforms are incomplete,” Glissman noted as he examined the picture. Many of the members had gone to the store and bought bell-bottom slacks of a color that, as closely as was possible, matched the rest of their outfit. They later got the proper period breeches. Others had to settle for chinos. Today, though no longer based in Ridgefield, the Connecticut Fifth is alive and well, and still reenacting the Revolution. For more information, see their website, http://www.5cr.org/ .